Fireside Adventures is proud to officially launch our Amazonia for those wanting to explore the incredible Amazon rainforest while travelling along the majestic countryside of Ecuador’s endless scenic spaces. "We are like the quinoa beans: if we are alone, the wind will take us far away, but if we are united in a sack, the wind cannot make any harm. We are like the páramo straw that is pulled up and grows again … and from straw of páramo we will sow the world"
An experience embracing the diversity of the Amazon Rainforest, Indigenous perspectives, Ecuadoran culture, fantastic food and the simplicities of adventure travel. Fireside Adventures is proud to officially launch “Amazonia” for those wanting to explore the incredible Amazon rainforest while travelling along the majestic countryside of Ecuador’s endless scenic spaces. Amazonia is not only connecting you directly with Indigenous and Ecuadoran communities, culture, people and their art, we are also enjoying the fine balance of being on and off the well-beaten path of an Ecuadoran adventure. You are officially invited to join Fireside’s Jeff Willis and Majo Obando who have teamed up with an amazing Ecuadoran Indigenous tour operator to co-lead a 14 day adventure travel experience. Date: November 24 - December 08, 2019. Deposit: $550.00 (required to secure registration). Includes: Pre-camp trip check-in (skype conference with attendees), tour guides and support, most meals, full accommodation, admission fees shuttle and land transportation in Ecuador. Does not include flight to and from Quito, Ecuador. We are inquisitive, intuitive, informative, reliable, intentional and a load of fun as we keep things simple, authentic, safe and meaningful. We just don’t like offering one of those “canned” or “carbon copy” touristy type of travel experiences. It’s just not our ‘jam” as we strive to connect with real people eager and ready to capture those generous and teachable life moments with others while embracing the best of adventure travel. Sounds like something you are interested in? Not convinced yet? Want to know more? Amazonia is about a small group of people having a big experience as we visit and connect with one of best places and people on earth. The people traveling with you are kind hearted, interesting, open minded and community orientated. The Amazon rainforest is considered the world’s lungs while holding the greatest source of bio-diversity of living life. Time to breath it all in! Visit the historical center of Quito - capital of the sun, where we will witness colonial works in the best preserved historical center of Latin America. Basic Spanish lessons including a mini “travelling wisely and lightly in South America” workshop so you got the essentials to have fun, be safe and so you don't stand out like a tourist. Toured by Canadian and Indigenous- Ecuadoran guides who are bilingual and very experienced in leading adventure travel groups. Visit Cayambe and the Cochasquí archaeological ruins while learning the historic and geographical significances of Ecuador. Connecting with Indigenous community leaders sharing their perspectives of the impact of western culture on their traditions, knowledge, language and Indigenous identity. They’ll also share their knowledge about interpretation of dreams and the position of the stars. Participate in the elaboration of handicrafts in straw shawl, mud and seeds. 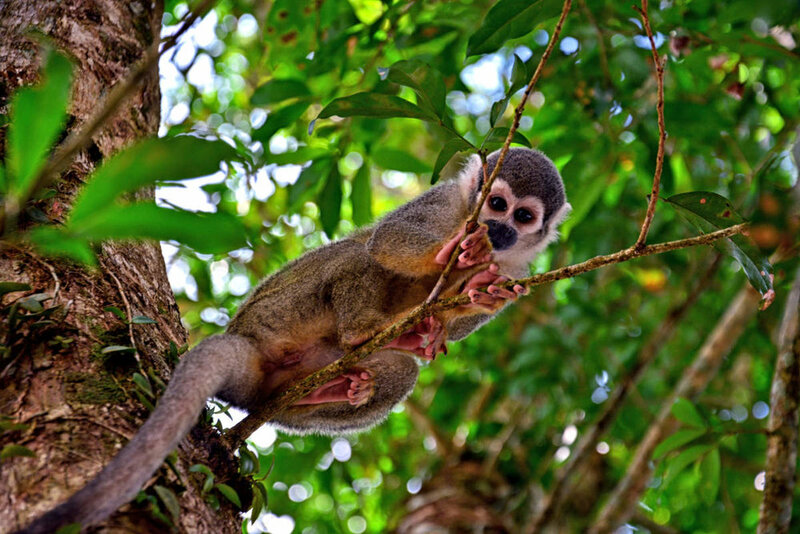 Stay in Amazon huts on the Cuyabeno River National Park Reserve as we are surrounded by different types of monkeys, hoazines, macaws, pink dolphins and many species of animals. Not to worry….. with luck we might see an anaconda far away. It would not be a Fireside trip without a day of paddling through a flooded forest ending with a conversation with Yachak (ancestral doctor) who will talk about their medicine and energy ceremonies. Enjoy the thermal pools of Banos and Pailón De Diablo. Options of to go rafting, hiking, biking, canopying before we head to the world’s biggest volcano “Cotopaxi”. 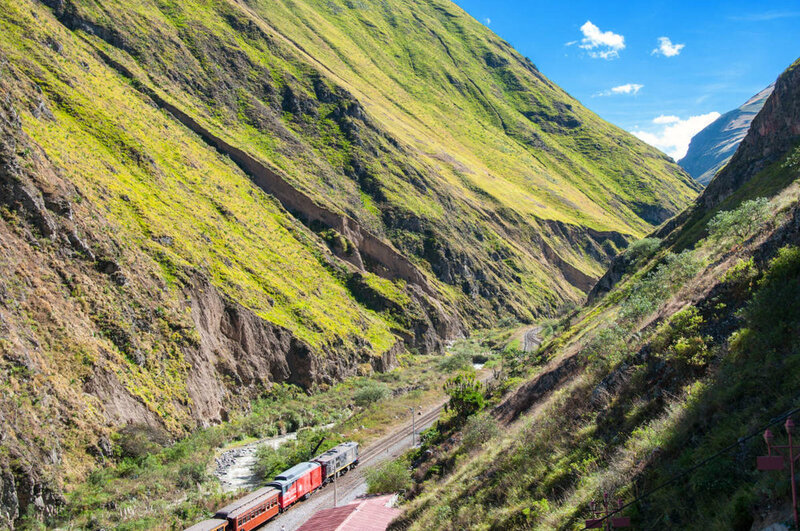 Jungle train through the Andes. Sadly 14 days will only scratch the surface of your Ecuadoran Amazonia experience, so stay longer and see more as you’ll be ready to travel more independently. Ecuador is a small country with four worlds offers travelers a trip full of unique and life shaping adventures. Its visitors can easily visit each of the four worlds of Ecuador: the Galapagos, the Pacific Coast, the Andes Mountains and the Amazon Rain Forest, separated from each other by short travel times. Ecuador is also a country with a vast and unique natural and cultural wealth. The diversity of its four regions has given rise to hundreds of thousands of species of flora and fauna. Ecuador is considered one of the 17 countries where the greatest biodiversity of the planet is concentrated, being also the largest country with biodiversity per km² in the world. We know it is impossible to visit all the wondrous places in Ecuador in just 14 days, so we have carefully designed an activities’ schedule that includes among touristic and cultural important locations. You will not be a tourist but an adventurer!!! You will get immerse in the Ecuadorian’s traditions, daily life activities, political, economic and cultural history, FOOD and the beauty of some forgotten populations that have decided to raise their voices to the world to let us know the extremely importance of preserving our nature, languages and knowledge. Ecuador is among the most diverse nations on the planet in terms of geography, species of flora and fauna and culture, you will have an everyday new adventure to live. 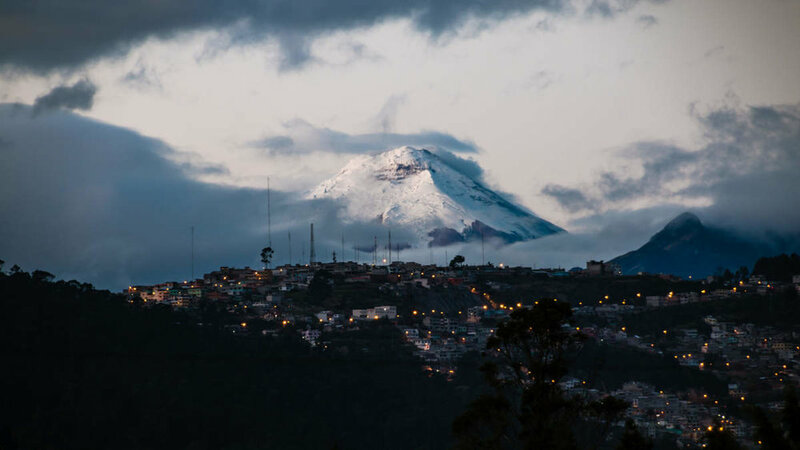 A little more info about Ecuador….. Considered as one of the most megadiverse and plurinational countries in the world, Ecuador is the home of several indigenous tribes, which have been living in these lands for thousands of years. Ecuador and its inhabitants have been struggling to fit into the worldwide economic model, leaving aside its cultural and natural richness. The current western society and the ongoing colonization practices have had adverse effects on Indigenous peoples in terms of loss of knowledge, culture, language, traditions, and identity. Indigenous communities have been obligated to raise their voices in order to protect and preserve their habitats. To have the opportunity to listen these voices represents a “life changing” experience. Countless stories and wisdom are waiting to be shared with you. Learn about Ecuador through the eyes of Indigenous peoples and its bio-diverse ecosystem. Learn about different cultural backgrounds. 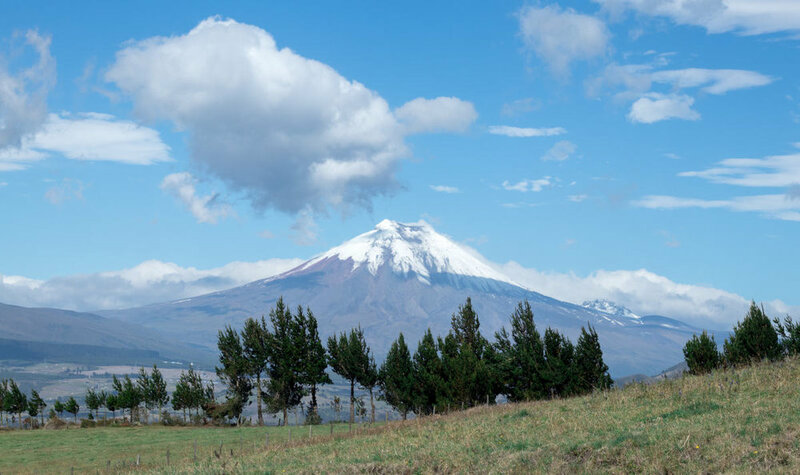 Although this adventure addresses the culture of Ecuador only, Ecuador is able to offer greater understanding of other Latin American countries. Understand oral and informal learning traditions and understand the role of colonialism, in a country where it is so fresh. Experience and learn from the knowledge, culture, language, traditions, food, and the daily life of the Indigenous communities in Ecuador. Learn about the Indigenous-eco-tourism models being steered by the communities we visit. Connect with Ecuador’s sustainable and conservation tourism model. Support touristic and cultural preservation projects that Indigenous communities are running.